Frequent hot flashes and night sweats, mood swings, loss of libido, and vaginal dryness are just some of the symptoms many postmenopausal women are happy to say goodbye to. Besides leaving behind a wide array of menopausal symptoms, women everywhere relish life after menopause. Although waiting for menopause to end brings a fair deal of uncertainty regarding what lies ahead, it is important to remember that the new stage will come with its own joys and concerns. Read on to find out about some things to leave behind - or to embrace - after reaching the postmenopause stage. From your 20's to your 40's the word “pregnancy” is a constant cause of concern and discussion. These decades are often referred to as “the childbearing years.” While these years can bring plenty of joy, their management also requires planning, which can be stressful. Once the postmenopause stage is reached, women will no longer be able to conceive or get pregnant, and menstruation ends. While for some women this can be a bittersweet ending, many women embrace it as a newfound freedom that allows them to spend more time, thought, and resources on themselves. During the menstruation years, the three main reproductive hormones - estrogen, progesterone, and testosterone - play large role in a woman's bodily functions and well-being. As women approach menopause, the production of these hormones decrease, causing a series of physical disorders and discomforts that are commonly known as “menopause symptoms”. The combined fluctuations of these three hormones, and the way they impact on other hormones (like thyroid or cortisol) are responsible for hot flashes, vaginal dryness, constant fatigue, or abrupt mood swings, among others. One of the joys of moving onto the postmenopausal phase is to see many of these symptoms disappear progressively. Most women report that after five years of being menstruation-free, their hot flashes have disappeared, and that they have experienced an increase in energy levels and greater mood stability. However, other symptoms like urinary incontinence or vaginal dryness may linger or worsen, and the risk of cardiovascular disease increases. Exercise is a vital tool in any woman's life, but those who are going through menopause can experience even more drastic benefits from it. It is known that frequent cardiovascular activity can brighten moods and provide extra resistance to hot flashes or increase libido. Once menopause is over and postmenopause sets in, it is important to continue physical activity, since it can also play an important part in the prevention of many types of degenerative diseases. Heart health is closely linked to cardiovascular activity, as are bone health and weight control. 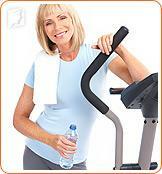 Adopting an active lifestyle can aid tremendously in stimulating a healthy body and delaying aging. Life after menopause has its ups and downs, but many women would agree that life gets better after menopause.